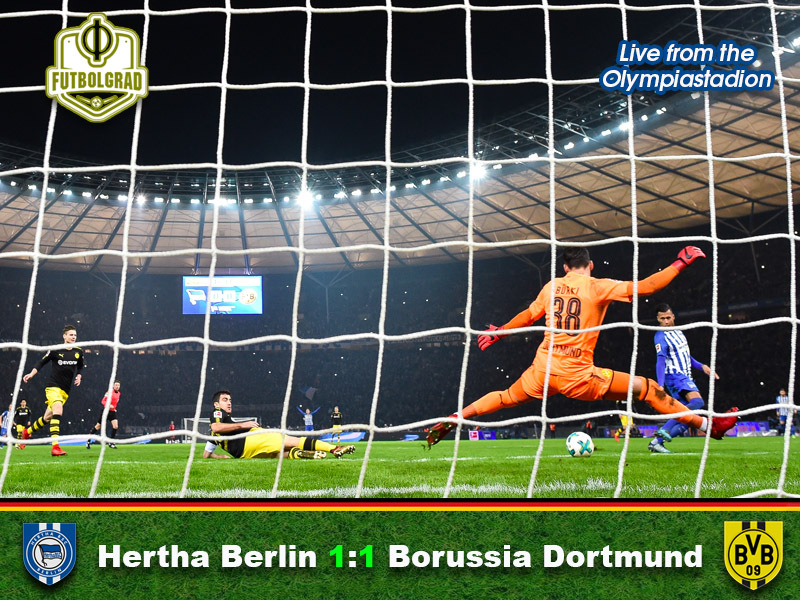 The German capital hosted Hertha vs Dortmund on Friday evening as Matchday 19 of the Bundesliga kicked off under the floodlights of the Olympiastadion. In a game that flattered to deceive, it was the hosts who took the lead before Shinji Kagawa made history. Scoring the Bundesliga’s 20,000th away goal, the Japanese midfielder ensured the Schwarz-Gelben left Berlin with a point. The temperature hovered just above freezing point in the Olympiastadion as Hertha kicked off Matchday 19. The first ten minutes paid homage to the climate, with neither side able to find any sort of rhythm. On the rare occasion that an attack beckoned it was the hosts who looked more likely to break the deadlock first. Toprak called into action early as Weiser flicked on a long throw, the Dortmund defender read the situation well and cleared his lines to avert the danger. Hertha’s early opportunities eventually kicked the visitors into action, Shinji Kagawa found himself unmarked in the six-yard box but the Japanese international could only steer his header over the bar. It was a glorious opportunity for Dortmund to take the lead and Kagawa knew it, his reaction to seeing the ball fly over the bar spoke magnitudes. Two minutes later and it was Hertha’s turn to rue a missed opportunity. Lazaro finding the side netting from a free kick after Pulisic had hacked down Plattenhardt. Roman Bürki will have breathed a sigh of relief, the Swiss ‘keeper was caught off-guard – scrambling over to his near post there must have been a moment where he thought the Austrian had done enough to leave him embarrassed. As the game approached the final minutes of the first half, neither side had conjured up the quality necessary to break the stalemate. The second half was barely a minute old before Davie Selkie slotted the ball under Bürki to send the home fans into delirium. Whatever Peter Stöger had told his side at halftime they hadn’t listened. Dortmund looked half asleep as Larazro fired in a sumptuous cross, Selkie kept his cool as he notched his fifth goal of the Bundesliga season. This should have been the catalyst for Dortmund to wake up; however, Hertha almost doubled their lead two minutes later – Plattenhardt this time with a testing cross, somehow Dortmund scrambled the ball clear. The Schwarz-Gelben hadn’t won in in their last three Bundesliga visits to the Olympiastadion, and as the clock hit 50 minutes it looked like the run would extend to four games. 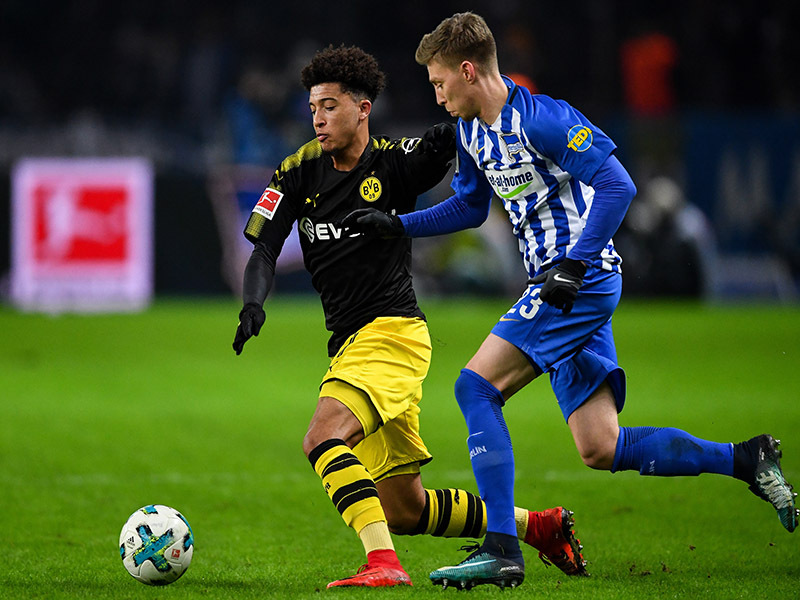 Suddenly though Dortmund kicked into life, powered by Jadon Sancho the Pokal champions began to threaten the Hertha goal. The 17-year-old had been the only positive for the visitors in the first half, his tenacity in the second was exactly what Stöger’s side needed. Against the run of play Hertha broke away, Salomon Kalou slipped the ball under Bürki, but for some unknown reason, Ondrej Duda decided to tap the ball in the net from two yards. He was clearly offside, a thoughtless moment cost the home side a goal – Duda’s evening was about to get worse. Five minutes later Weiser gifted the ball to Sancho, the Englishman picked out Kagawa and the midfielder didn’t waste this opportunity – the Bundesliga’s 20,000th away goal was finally scored. Dortmund could smell victory, Hertha were subjected to wave after wave of attack. Isak went close on two occasions, his second chance cannoned off the bar – die Alte Dame were dangling by the thinnest of threads. As the match entered the fourth minute of added time Dortmund’s Yarmolenko was dragged down in the box. The referee waved away the protests, the Dortmund bench rose in unison screaming for a penalty, it never came and for the second game running Borussia Dortmund left the pitch with only a point in their back pocket. The 17-year-old showed ability way beyond his years on an evening when he outshone those around him. His darting runs down the wing powered Dortmund to an eventual share of the points. Twisting and turning with ease he gave the Hertha backline a night to forget. Outperforming both Schürrle and Pulisic, the left sided attacker was a thorn in the Berliners side all evening. Ondrej Duda will have sleepless nights recalling his inexplicable touch two yards out to cancel out Kalou’s goal bound shot. Luckily the Slovakian’s mistake was overshadowed by referee Christian Dingert. The man in the middle missed Yarmoloenko being thrown to the ground in added time before he then went on to ignore all the protests to consult VAR. The players reaction on both sides should have been enough to prompt Dingert to go to Köln for advice, he declined and blew the whistle for full time. Crazy! Hertha hold on despite only managing 40% possession. Dortmund fail to win a Bundesliga game in the Olympiastaion for the forth consecutive match. Duda’s mistake comes back to haunt him as Kagawa fired the visitors level.